Lymphoblastic leukemia/lymphoma (i.e., acute lymphoblastic leukemia/lymphoma or ALL) is the most common type of cancer in childhood. The age-adjusted incidence rate is 3.1/100,000 in children, so approximately 2500–3000 children are diagnosed with acute lymphoblastic leukemia (ALL) each year in the United States). Approximately 80–85% of the cases are B-ALL and 10–15% are T-ALL (Table 9.1). Approximately 75% of ALL occurs in children under 6 years old, but it can occur at any age [1, 2]. Patients typically present with anemia, thrombocytopenia, and/or neutropenia-related signs and symptoms such as fatigue, weakness, shortness of breath, easy bruising, bleeding, and infection. Genetic factors play important roles in cancer initiation. Age, WBC count at disease presentation and genetic aberrations dictate risk stratification. Buitenkamp TD, Izraeli S, Zimmermann M, Forestier E, Heerema NA. van den Heuvel-Eibrink MM, et al. 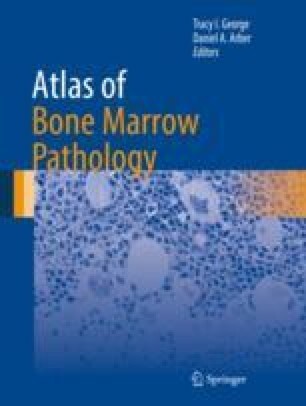 Acute lymphoblastic leukemia in children with Down syndrome: a retrospective analysis from the Ponte di Legno study group. Blood. 2014;123:70–7. https://doi.org/10.1182/blood-2013-06-509463.